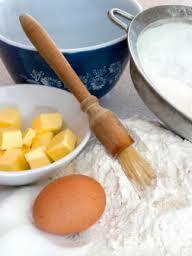 Baking Powder...1 tsp.....1/4 tsp. soda plus 1/2 tsp. cream of tartar. White Flour...1 cup ...3/4 cup whole wheat flour or 7/8 cup rice flour or 1 cup corn flour, or 1 cup cornmeal or 1 1/2 cup rolled oats or 3/4 cup buckwheat or 1/2 cup barley flour or 3/4 cup rye flour.